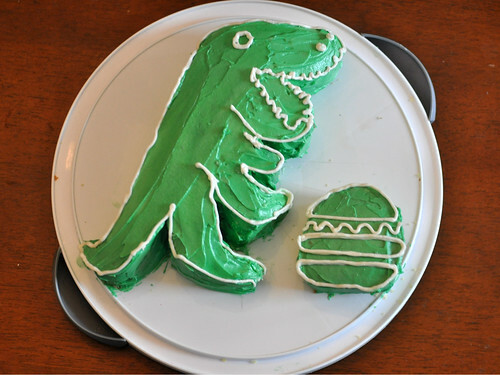 I'm going to admit here that the dinosaur's cake innards came from a blue box. But stuffed inside that delicious boxed mix yellow cake was homemade dark chocolate pudding (seriously, this is my favorite chocolate pudding EVER). The chocolate pudding filling was in part a tribute to Lil B's current favorite book, Goldilocks and the Three Dinosaurs by Mo Willems, a retelling of the classic tale where chocolate pudding factors in prominently. The cake was topped with my own version of grocery store buttercream--you know the sugary part shortening, part butter frosting. Lil B went crazy for it. After announcing it was a "Dinosaur eating a hang-ka-bur, he proceeded to plant his face and teeth into said hang-ka-bur. When he came up for air he said: "Mama, I'm sharing the hang-ka-bur with a dinosaur!" How does it stack up to past birthday cakes? You be the judge. Here's the 1st cake and the 2nd. I do think my decorating skills are getting better and better. Adorable! So sorry we missed that part of the party! Happy birthday, Lil B!